Mummy Of 3 Diaries: I've got one Easter Eggstravaganza of a prize - Who wants to #win it? I've got one Easter Eggstravaganza of a prize - Who wants to #win it? I've got one Easter Eggstravaganza of a prize. You may be thinking it's a little early to be thinking about Easter but not for me. I've already bought my children's Easter Eggs, they're all hidden away ready for them. I didn't want to miss out on the ones they wanted. The love Giant Kinder Eggs, so I have to get them early. I've had a little bit of luck myself over the past few weeks so I'd like to give something back and this is how I'm going to do it. 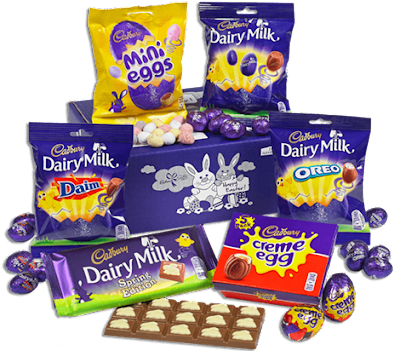 I'm offering (and paying for) a Cadbury Easter Egg Eggstravaganza gift box which is filled with a host of Creme Eggs, Mini Eggs and Spring edition white and milk chocolate bar and all delivered to your door in time for Easter. To win, simply use the Rafflecopter form below (please allow a few seconds for it to load). Terms & Conditions: Open to the UK Only due to delivery restrictions. 1 Winner will be drawn at random on Sunday March 12th from all the correctly made entries. I would love a Twirl Easter Egg! Any old egg will do...I didn't buy myself one last year as I hoped that either my husband or children would treat me....probably something cadburys....mmmmm.. I would love a Hotel Chocolate Easter Egg, but I'll probably end up popping into the Cadbury World shop for mine. A Cadbury's Mini Eggs egg. Anything cadburys will do me! I'd love a creme egg one. Im a bit obsessed! A Galaxy Easter Egg! Yummy! I would like a Cadbury's Caramel. I don't mind, do like Ferrero Rocher though. As I'm on a diet, I should be hoping for none!! But secretly I would love to Lindt one, my favorite chocolate! One of the really special (=expensive) ones from waitrose. Also have already had about 20 bags of mini Cadbury daim eggs. Anything with mini eggs! I could eat a whole bag! If Dime bar has one then that's what I want! One with some kind of truffles would be great. I'd love one of the giant Lindt ones! I'm hoping for a Reese's Easter Egg! An After Eight egg, delicious! The ChocABlok ones are unbeatable! Possibly Milk Tray. As I do enjoy Cadbury's milk chocolate etc. A big bag of mini eggs. Then i am happy! I really REALLY want one from Hotel Chocolat. However I know that is unrealistic unless I buy it myself so I would settle for a nice Cadbury's Caramel egg! The Tesco one that won the award for the best one! Any of them to be honest but the bigger the better lol :). Any as long as it's a big one as I've given up chocolate for lent! Yummy, I need a chocolate fix! I'd love one from Hotel Chocolat! They look incredible! I'd squeal the place down if I received a Hotel Chocolat Classic Ostrich Easter Egg. I had one 3 years ago and it was amazing. I would really like a nice posh one failing that a cream egg one would be nice. ooohhhh havent even thought about it!!! Any would be a nice treat,I love chocolate! Taking my daughter to choose one for each of us. I would love a Creme Egg egg! Giant cadbury button easter egg....yum! A huge nwhite chocolate one ! Mini egg easter egg is my favourite. I'll be totally happy if I just get a multi box of creme eggs, I LOVE them! One that has not diminished in size to hardly anything when you get rid if all the packaging! Any kind of Cadbury's one as that's my fave chocolate! Any Cadburys easter eggs! Looking forward to it already!! I am very fond of Booja Booja dairy free chocolate eggs but I love all chocolate and am grateful to receive it. I'm quite happy with a bar of milk chocolate, or maybe a box of After Eights. a very very very BIG one!!!!!!!! As long as it's Cadburys, I'm a happy girl! I dont mind what the chocolate is, but ive seen some Star Wars eggs that I would love! Don't mind as long as it's big! I saw a Marmite Yeaster Egg that I quite like the look of! Creme eggs, I have resisted so far, but I think I might cave in and get one next time I'm out. A Cadbury's Creme egg one. Although I'd really love one of the extra thick Hotel Chocolat eggs, I'm still very happy with the Cadbury chocolate button one that I'm sure to get. A big Ferrero Rocher one would be very welcome.